Do You Want a 50% Increase in Sales? On Average Our Golf Cart Dealers See a Constant Surge in Activity & Sales While Using Our BYGC Software. Check out this quick video to see just how easy it is to setup your cart builder! 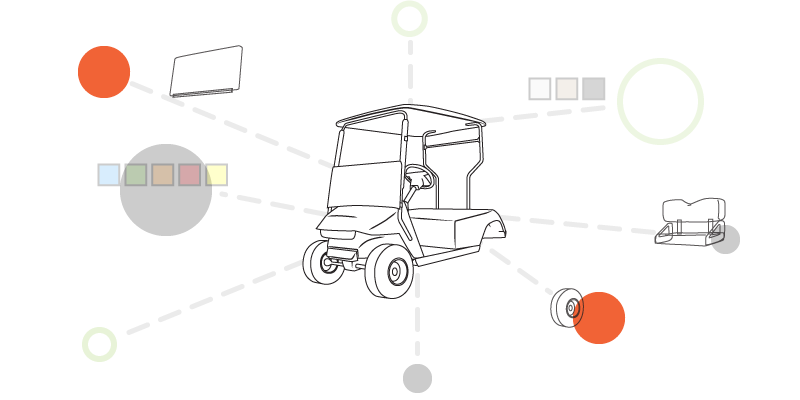 Build Your Golf Cart user dashboard walkthrough. Dealers can access their saves and make changes in app. Windshields, light kits, dashes, back seat kits. Short and long top roofs options. Select your paint color or body style. Over 200+ seats to enable on your cart builder. Save your cart build and you will receive an email with your options. Change out the rims you’d like to show in your cart builder. Access to our database of 500+ options. More added every month. Build a Golf Cart and Have it Come To Life! Currently we offer the Club Car Precedent, EZGO RXV and Yamaha Drive models. Choose from an array of options to create your custom golf cart. Part brands that are available in the software are Nivel, Madjax, DoubleTake, Nuerra and more. You can choose from any of these building blocks to construct your BYGC builder. You get 10 new parts added for FREE with your signup! The BYGC Software is a tool that EVERY custom GOLF CART DEALER needs! Working with golf cart companies has revealed to our founder Mark that there is a need for you, as shop owner, to portray how you customize Club Car, EZGO and Yamaha golf carts. Mark’s brought the shop assembly to the online world, enabling you to visually demonstrate your capabilities to customize golf carts to anyone, anywhere, anytime. Have questions? Check out our Q&A. Subscribe for FREE PDF Parts List and News. Join our mailing list to receive the latest news, education and updates from our team.